As I’ve mentioned on an earlier post that I’ve been invited to a four-day press trip to Los Cabos, Mexico by the Los Cabos Convention & Visitors Bureau. Overall, it was an exciting, fun yet relaxing place to be. 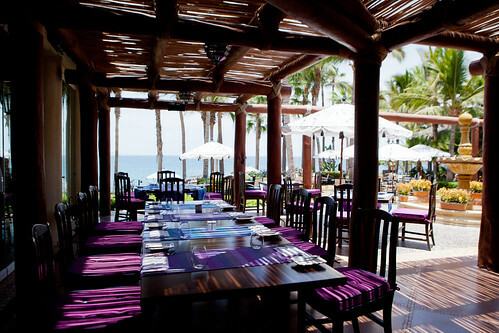 For every resort we’ve stayed or visited, I can’t get enough of the jaw dropping views of the Baja-Pacific coast. Of all the four or so resorts we’ve been to, One&Only Pamilla was my personal favorite. The understated glamour and unsurpassed, personalized service are the main two reasons why I highly recommend anyone to stay here. 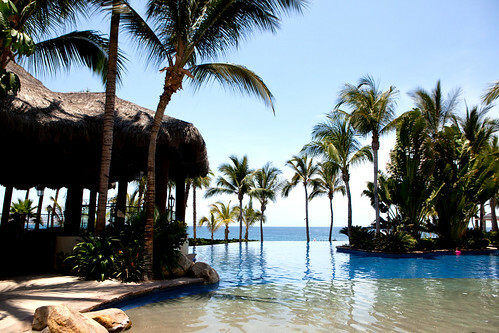 It is a AAA 5-diamond rated resort and receives many accolades like Travel + Leisure (August 2011) listed the resort as “The Best of the best” hotels in Mexico. This luxurious property was originally built in 1956 as a 15-room luxury hideaway by Don Abelardo Rodriguez, son of the President of Mexico. 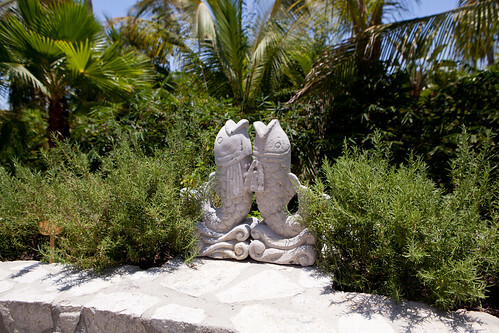 Back then, it was the tropical getaway for Hemingway and Harlow. 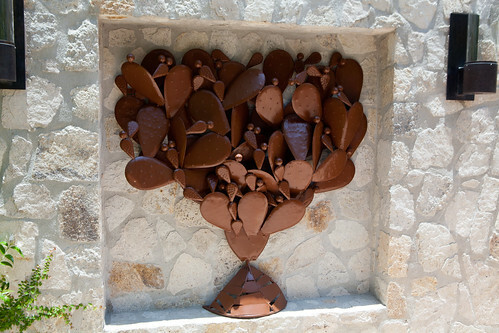 In 1991, the Palmilla Golf Club opened, and in 1996, the property was again expanded to 115 rooms. 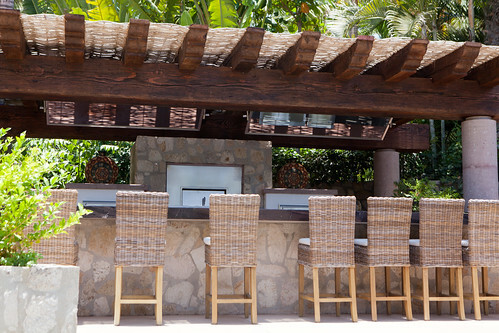 The glamorous ambiance of the original resort were carefully preserved in One&Only Palmilla, which opened in February 2004 following a $90 million refurbishment. The hotel still has its celebrity clientele with a mix of well to do couples and families who want their break from the hustle and bustle of daily life. We had our own gorgeous Ocean Front rooms that has an outdoor private infinity pool that has a view of the glorious Pacific coast. 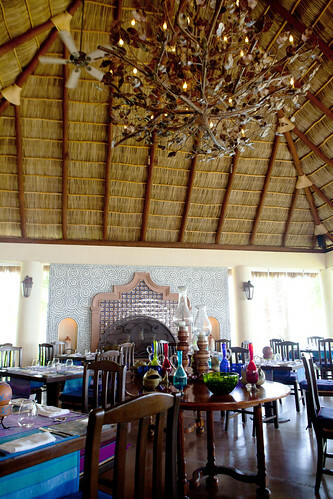 The room was decorated in a contemporary Mexican style. 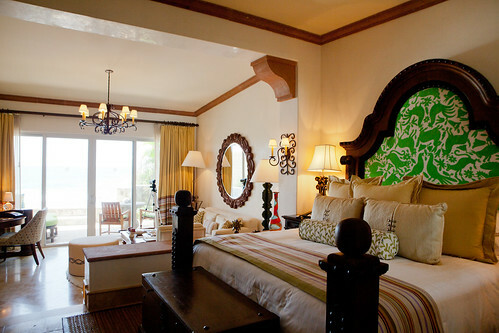 Bold green and white pattern on the bed’s headboard but everything else was clean with the attention to details, especially with the wooden carvings on all the furniture, and a spacious bathroom. The piece furniture that I was completely enamored was this replica of a handsome, wooden Mexican-style chest that is the room’s bar filled with top-shelf spirits. We had a tour of the property’s vast grounds. 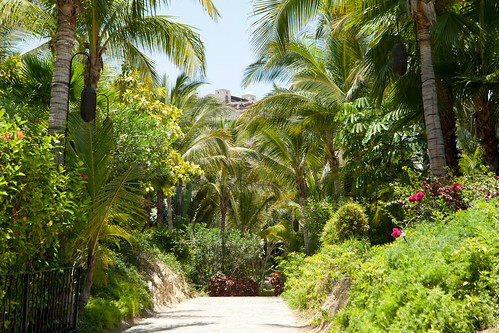 Lush, sprawling palm trees and tropical plants covered the grounds (beyond the lovely pale yellow sandy beaches). 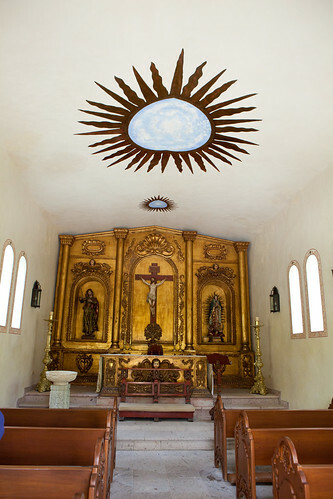 The charming, renowned chapel that sits on the top of the hill. 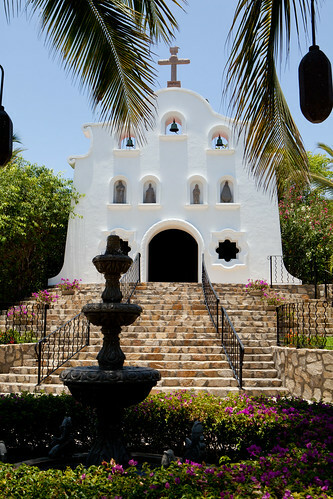 The chapel makes it one of the very popular reasons why couples get married here. 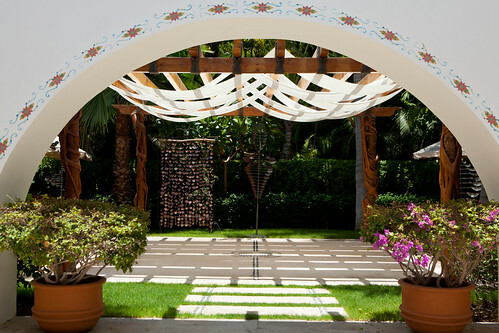 There’s a serene yoga garden where one can go to take a class or after one has a spa treatment. The most recent venue they opened within the property six months ago is the Herb Garden. This area is lush with various herbs like rosemary, marjoram, basil, and mint and they have a state of the art open kitchen. 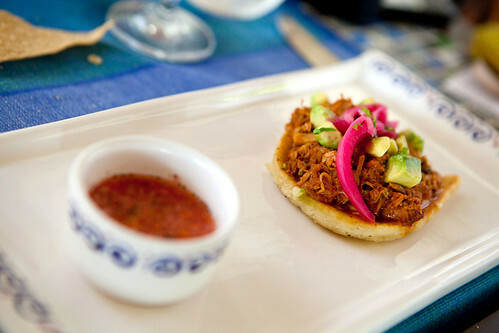 There’s cooking demonstrations led by visiting Mexican chefs. 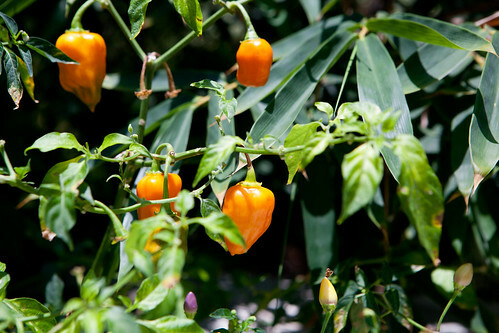 It is able to accommodate up to 12 guests, each culinary class begins with a guided tour of the herb garden including a collection of indigenous chilies such as habanero, pequin, and poblano and herbs such as cilantro, epazote, sweet basil, and hibiscus tea plant. 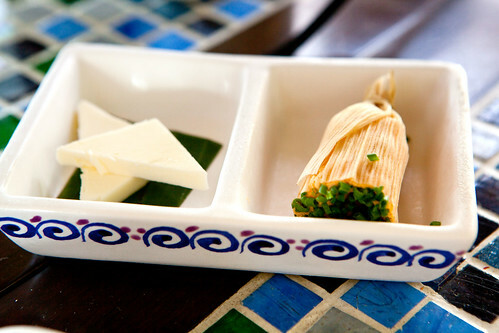 Each demonstration will be paired with a Mexican wine or tequila for guests to enjoy. 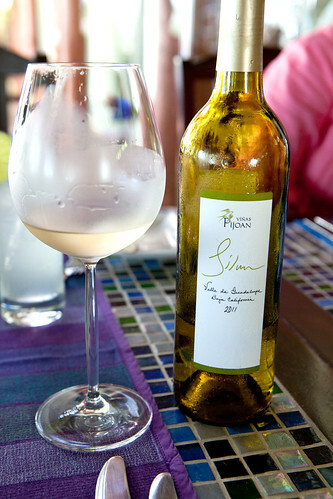 We eventually had a delicious, mostly seafood, three and a half-hour long lunch paired with Mexican Baja wines at Agua Restaurant. 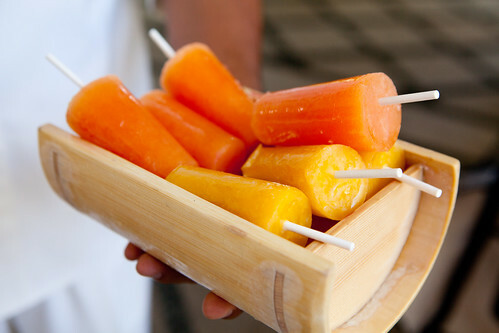 This restaurant is supervised and consulted by Chef Jean-Georges Vongerichten. 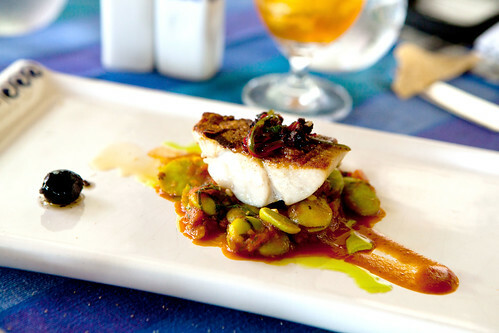 The Executive Chef of Agua is Chef Larbi Dahrouch, who have a Moroccan background but adapted these flavors to Mexican cuisine. 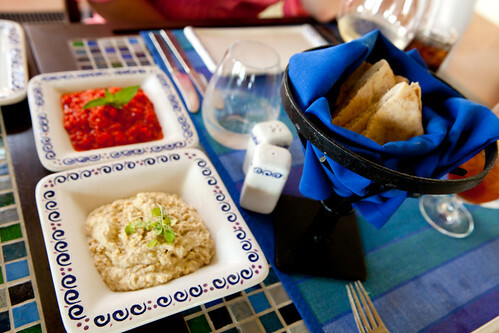 We started with traditional Mediterranean spreads, excellent hummus and red pepper spread with warm pita bread. For our first two courses, we had a raw (or barely cooked) seafood courses. 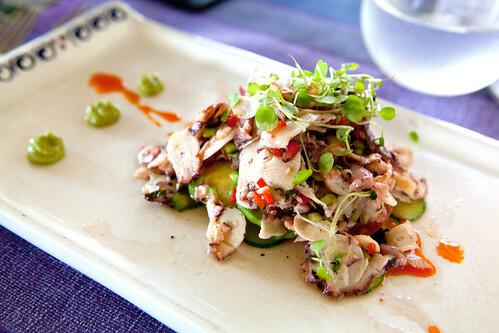 The octopus salad was poached until its tender and sliced into thin pieces. It’s mixed with avocado, cucumber, subtly smoky paprika oil, and jalapeno peppers to give it a hint of a spicy kick. 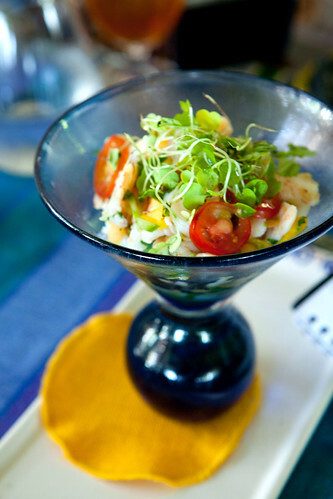 The shrimp ceviche was vibrant and refreshing, as it has cubes of fresh sweet mango, cilantro, tomato and jalapeno peppers. 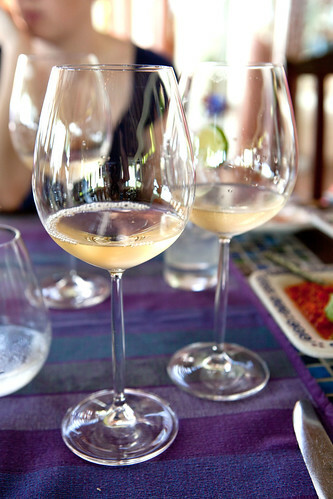 The two whites paired for these courses were the Natal Chardonnay 2011 and Viñas Pijoan Sil Baja 2011, a Chenin Blanc from the Baja region. Both were very crisp and stood up to the acidity of both courses. 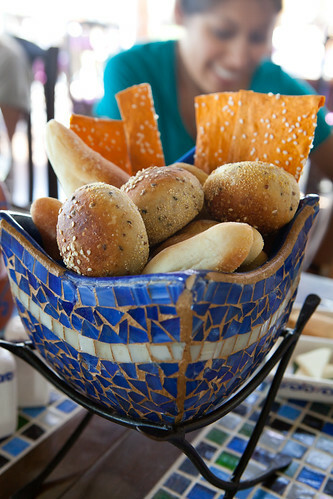 Then bread service was a large ceramic basket, if you will, filled with various warm rolls, crisp flatbreads and demi baguettes and little plates of unsalted butter and a tamale-wrapped chili butter (which was quite spicy in a good way). The crisp-skinned salmon with ribbons of carrot and radish, sauced with a tart, creamy yogurt splashed with paprika oil, a roasted chili pepper, and a hexagon of brown quinoa and thin disks of cool cucumber. The halibut with olives and lima beans was a slightly lighter dish than the salmon and I adored the brininess of the olives. 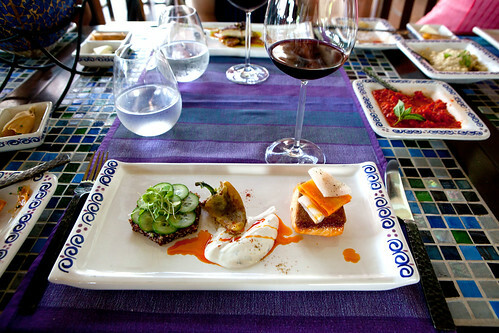 The Cabernet Sauvignon the sommelier chose for these two dishes were from the Valle de Guadalupe region. 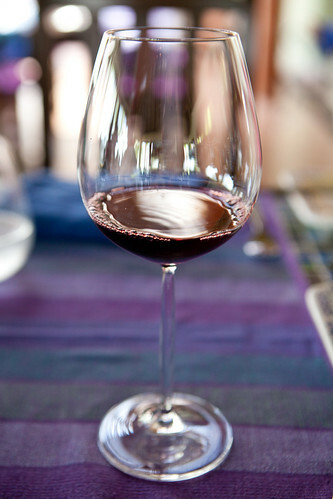 It’s a delicious young red wine that doesn’t dominate the fish and it does play along well with the spices. The chef sent out more dishes just in case we weren’t full enough. 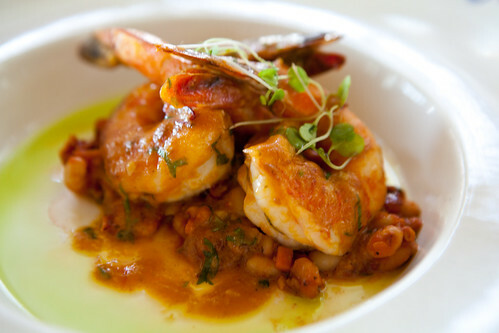 We had large, palm-sized (at least my palm) prawns in a hearty tomato sauce, sitting on a bed of creamy navy beans. Tender, sweet and it was my favorite dish of the entire meal. The Mexico corn cake topped with pulled pork and a side of habenero pepper salsa was delicious, only if the salsa was used sparingly or you’d be faced with pain. 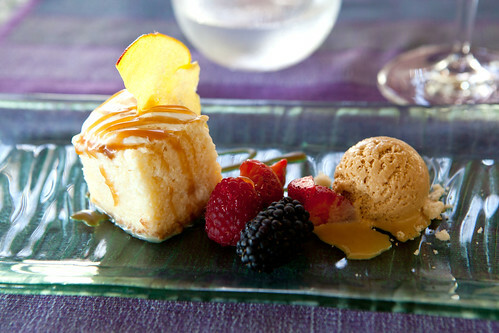 For dessert, we had tres leches cake, topped with a dried mango chip with fresh berries and dulce de leche ice cream. It’s a fantastic dessert to finish this meal. 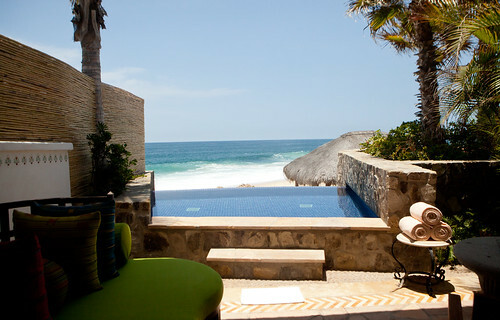 After that wonderful meal, all I wanted to do is retire to my Ocean Front room and take a siesta then party. wow! Absolutely Lovely Luxury Resort. I’m very enjoy your romantic photos! I love to read your real travel story!